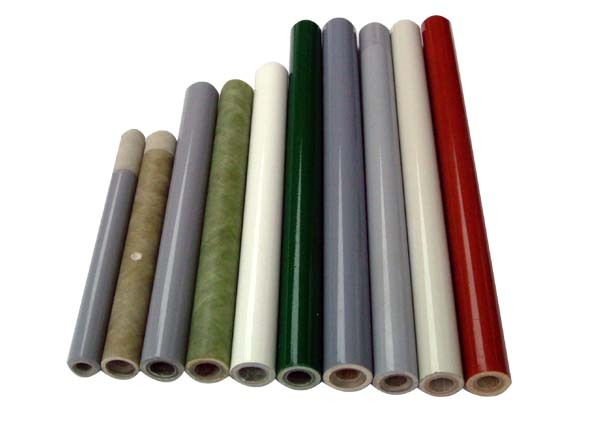 Material： Import epoxy resin, fiberglass silk, vulcanized fiber tubes .uses a combination of insulating materials. A core of Vulcanized Fibre is overwrapped, by filament winding, with a fiberglass-epoxy shell. The angle of wind is optimized to provide a finished tube with good tensile and burst strength.The eliminated arc complex tubing of epoxy nonalkali fiberglass forms in the process which nonalkali fiberglass gauze dipped epoxy resin liquor twists the steel paper tubing，then is solidified. the fuse tube is fabricated by winding a filament-wound glass-epoxy outer tube over an inner tube of vulcanized fiber that provides the arc-quenching propertiesThe product is widely used in the fusion tubing of high pressure fallen fusion box design. With good machinability, the product can be sawed, cut, bored, and roped silk. All this machinability does not cause flaws like crackle, bedded structure, desquamation etc. All specification can be made-to-order. The color of inner tubing contains red and gray. The color of outer involves red, yellow, white, green and gray. The surface of the complex tubing is daubed proof-ultraviolet coat. Application:Used widely for electrical fuses, where the quenching and insulating properties of the FORBON core and high strength.such as cut-out fuses,arc extinguishing,Fuses,circuit breaker etc.